Ouray County Roads 2 and 4, With Surprises! This is one of my favorite spots around here. It's not far from home and is a great respite after work. The location is a parking lot at a locked gate at the eastern end of Ouray County Road 2. Behind me is a hay field. One of my favorite set of roads roads is very close to home—in fact, I don’t even need to travel over any paved roads to get there. The little complex made up by Ouray (Colorado) County Roads 2 and 4 is much overlooked and worth the time to explore. Billy Creek State Wildlife Area covers much of this territory; the rest is private land or BLM. I have one previous post on the subject (here, includes video), plus a post about exploring the side road off CR 4 with Glenn Neigenfind (see http://dcasler.com/2010/05/27/mystery-side-road-off-ouray-county-road-4/), plus I made a video of some horses along CR 2 (here). This is my first post with a GPS map showing the whole area. The county roads are fairly straightforward. I usually start near where CR 4 meets U.S. Highway 550 and head east (be sure to follow the signs or you’ll end up on the dead end CR 4A). The road has some scree but is not terribly steep. I enjoy it, and at milepost 4 there’s an overlook that provides stunning views of the entire Sneffels Range, the Cimarrons, and the valleys below including Log Hill and Pleasant Valley. Further travel takes you to a locked gate, but you can backtrack a little bit and head down the hill on County Road 2B (shown on the map as 4B—I think the base map is wrong). This gently-descending road is in better shape than CR 4 and also offers views. It goes way down into the canyon and then up over a little divide near a campsite I’ve often seen in use, then down to meet CR 2. 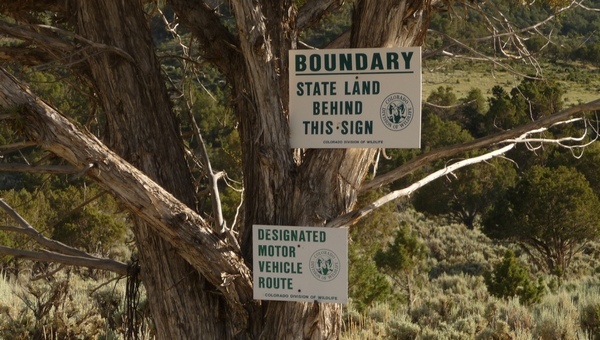 If you turn right, you’ll end up at another locked gate and a wide spot for hunters to park (they have to continue either on foot or horseback). I love that particular spot, especially in the autumn. It’s far enough from the highway there’s no traffic noise at all, just the gentle breezes and the sweet smells from the hayfield. The picture at the top of the post was taken on July 7th. When I revisited on August 13th, I ran across Dave Hale, the Colorado Division of Wildlife person who manages the Billy Creek State Wildlife Area. He was spraying noxious weeds with weedkiller. We had a nice conversation and I learned more about the area from him. Back on July 7th, I came across these signs while taking a peek at a side road I’d been on before. They surprised me, as what lays beyond can barely be called a road. 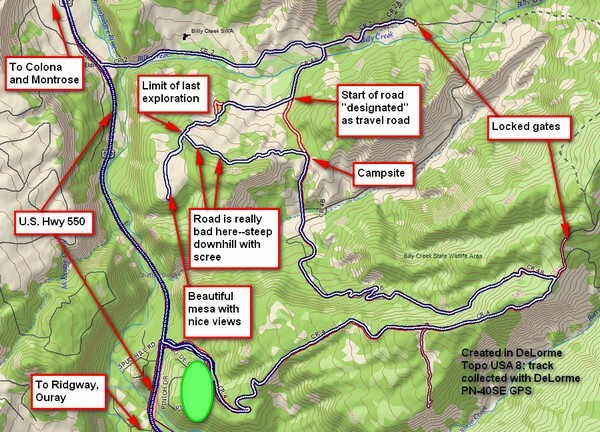 The "route" in question is little more than a rutted track. But it's officially designated as a road I can travel on, so I set out to explore it to its limits. Last year I’d been up this road to where I thought I could go no further due to steepness and scree. Well, on July 7th, I repeated this and ended up at the same place. But careful study of aerial photographs (available as Color DOQQs from DeLorme) showed that the road continued and in fact looped back to the campsite I mentioned. So, on Friday, August 13th, I attempted the road from the campground end. The road is equally severely rutted and features a steep downhill full of scree. Lo and behold, I came out right where I’d been before. I took a good look at the steep stretch I thought was covered with scree and as it turned out there wasn’t all that much scree. So, I toodled on up and found myself atop a mesa. The mesa had been cleared of trees some years ago as part of providing more habitat for deer. I think the area is simply beautiful, and rode very slowly, almost reverently, to the far edge of the mesa on a poorly-defined road (but I did stay on the road!). So, here’s the GPS track, actually a compilation of several tracks (in different colors). The appendage hanging down from CR 4 was the subject of an earlier post (see here), otherwise I’m presenting much of this information for the first time. Here's the GPS track showing the entire area. You can see where the sign is that marks the road as okay to travel.. In all fairness, some of the side road there, including the road up atop the mesa, is very poorly defined to the point of being hard to make out. But I absolutely stayed on the road! I really recommend CR 2 and 4 quite highly. I’d rate them as beginner+ (the main roads) and intermediate for the side roads due to rutting and steep spots with scree. This entry was posted in GPS Tracks, Motorcycling, Ouray County. Bookmark the permalink.